Homelessness campaigners will march on Whitehall in London on Wednesday evening to protest against the criminalization of homelessness by UK authorities. The March for the Homeless takes the theme ‘No more deaths on our streets’ in a bid to highlight the fact 149 people in London died as a result of homelessness last year. 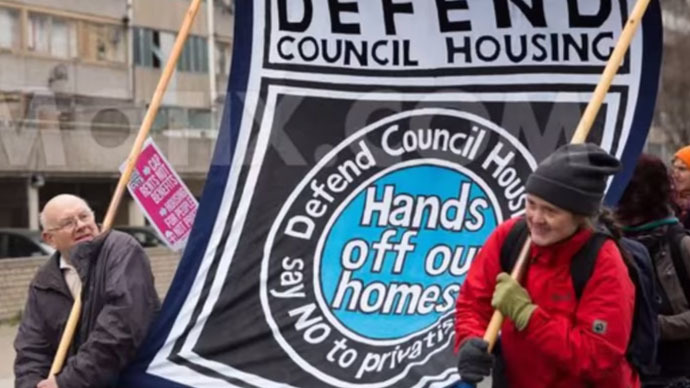 Hundreds of activists are expected to descend on Downing Street, the prime minister’s residence, to protest against both rising homelessness and the subsequent clamp down by authorities. The march, organized by homelessness groups Streets Kitchen, An’itch Spinal and Unite the Union, will also seek to register homeless people to vote ahead of the general election in May. Demonstrators point to the fact that homelessness has risen 55 percent since David Cameron became prime minister, with at least 742 people sleeping rough each night in London alone. Despite this rise, corporations, councils and the Metropolitan Police have introduced new methods to target homeless people in the city. The introduction of “anti-homeless spikes” became a hot issue last summer, after metal spikes designed to stop people sleeping in open spaces were installed around London. Supermarket giant Tesco was forced to remove spikes from outside its Regent Street shop following complaints by customers. An online petition calling for the removal of metal spikes from a building in Southwark and others in the capital garnered more than 130,000 signatures. The properties’ owners eventually removed the spikes after London Mayor Boris Johnson spoke out against them. Officials “processed” 37 people and forced dozens more to leave, the Huffington Post reported. Thirty-five were handed “cease and desist” notices, while one was repatriated and another agreed to return to Romania. Activists claim Operation Encompass, which is supported by several London councils, criminalizes homelessness by making it illegal to sleep rough or beg. Arizona Smith, 22, a journalist and campaigner, spoke to RT about her reasons for attending the march. “I am personally passionate about housing and rights for vulnerable young people as I was homeless and squatting for parts of my teenage years. Smith, who is studying English Literature with Creative Writing at the Open University, said she has seen first-hand the lack of support for the “huge numbers” of homeless people. Street Kitchen coordinator John Glackin said the march would remember those who have died from homelessness. He said: “People need support from society not to be kicked when they are down. They are being killed by the cold and indifference, and are running out of places to turn to as austerity hits the services they use. The March for the Homeless takes place outside Downing Street, Whitehall at 6pm on Wednesday evening.